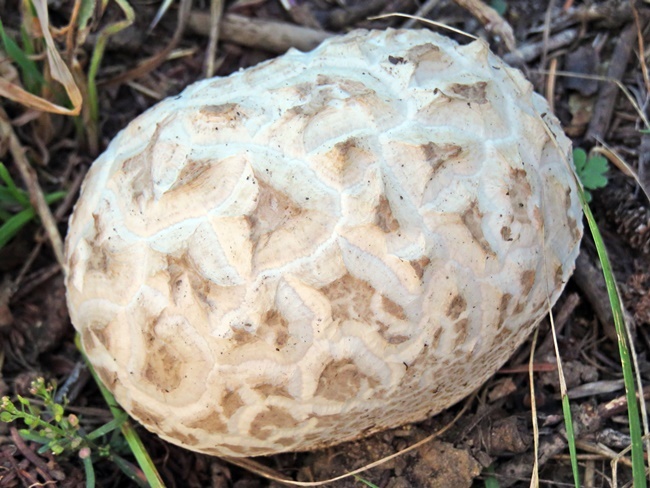 grows up to 60 cm broad, widely oval with sculptured or scaled white/tan exterior. flesh must be firm and all-white. flesh must be undifferentiated with no trace of gills and no outline of mushroom visible in cross section. grows alone or as several together in pastures or open, grassy, arid areas, often near sagebrush. has a mild, pleasant taste and a strong/unpleasant odor when young; cook before eating.